1TB £39.99. Graphic Card NVidia Quadro 310 1GB. 8GB £18.99 . Windows 7 Pro £14.99 . Dual boot : Mac OSX 10.11 (El-Capitan) (optional) Win. Optical Drive DVD Super Multi drive. (Yes that's right, both OS in one PC !). MSI N650 2GB DDR5 N650-2GD5/0C VGA DVI HDMI. 64GB SSD (O/S). 750GB HDD (Storage). WIFI Dongle Installed. i.e. between 9.30AM-10.30AM. Key Features. I.e. between 9.30AM-10.30AM. Key Features VGA/DVI Port. I bought this computer mid December for a job I was planning on taking from home. I decided to refused the job offer after I already purchase the desktop. The computer is brand new I still have the original box (see picture). I am also including a Netgear modem , Netgear router and an analog headset in this sell (worth about $150.00 all together). You don't have to lease it from Comcast or your internet provider. PLUS IT ALREADY HAS AN ANTI - VIRUS INSTALLED (worth $60.00). Used Acer Aspire Revo 3700. Recovery CD. Wireless lan. Last updated on 3/08/2018 / June 05, 2018 to windows 10 latest version ""1803."". ACER Processor Speed: I5 6440 3.40GHz. The Computer Club states this Acer Aspire may / should last you over 20 years with the proper care. Up for sale is a Acer Veriton M460. We refurbished this, everything works. Primary Drive: 1TB HDD. 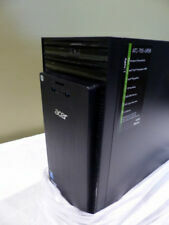 1x Acer Aspire TC-605 Desktop. Product Condition. Product Information. Our Mission. Competitive Prices. Bookmark Us. Our great team provides refurbished technology; digital literacy and vocational training to as many qualified humans as possible. Slightly used. Works like new. Mouse- Yes (used). Computer Stand - NO. NVIDIA GeForce GTX1060 3GB GDDR5. 1TB 7,200RPM Hard Drive. Give yourself an edge with the powerful Aspire GX-785-UR1B Desktop. 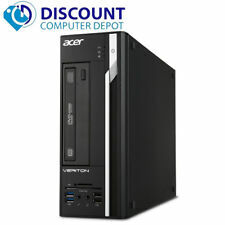 Acer Aspire Desktop GX-785-UR1B. 8GB DDR4-2400 RAM. 8x DVD-Writer Double-Layer Drive. MODEL: ACER ASPIRE AX1200-B1701A PC. VIDEO: NVIDIA GEFORCE 8200. OPTICAL DRIVE: DVD /-RW. Network (RJ45) port. Serial port. The desktop is in really good condition. The system has been fully tested and is in working condition. Card reader. DVD Optical drive. Computer BUNDLE (Excellent conditions) . - Acer G185H 18.5" Monitor. - USB hub (1 Male --> 4 Female port extn.). - WD (Western Digital) My Book Essential external 1TB Hard Drive (perfect for backup/ recovery ). Acer Aspire Revo R3610 Black/White Desktop PC Atom 330 @1.60Ghz, HAS 2GB RAM, has integrated WIFI.No hard drive or software included. In good used powering on and booting to BIOS condition. Sold as pictured.